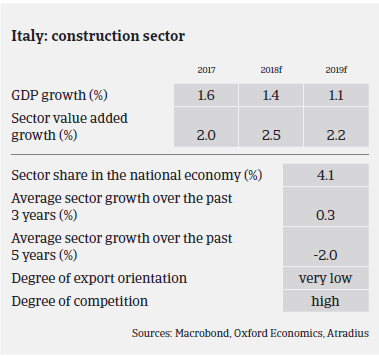 While Italy´s construction sector continued to grow in 2017 the industry is still far away from a real rebound, as construction investments in Italy shrank by more than 35% between 2007 and 2016. According to the Italian construction association ANCE, construction investment increased just 0.2% in 2017, driven by restorations (up 0.5%) and non-residential building activity (up 0.6%), while the new residential building segment continued to contract (down 1.5%). In 2018, the modest recovery in construction investment is expected to continue improving 1.5%, with positive growth anticipated across all subsectors (investments in new houses and restorations up 1%, commercial constructions up 0.7% and growth in public construction up 4%). According to the Italian government EUR 100 billion is earmarked for public construction spending over the next 15 years, and an additional EUR 3.3 billion is earmarked for rebuilding activities in certain regions affected by earthquakes. 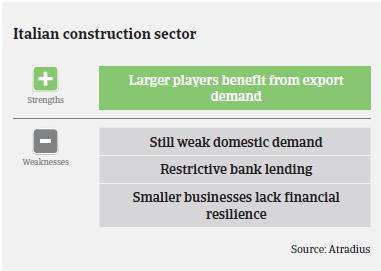 Next to the still low spending capacity, tight lending conditions set by banks remain the main reason for the still subdued performance of construction, exacerbating the fact that many Italian construction businesses remain highly geared. New loans for construction businesses decreased 68% in value between 2007 and 2016, but in 2017 some signs of stabilization were seen. late payments from public bodies have also contributed to market difficulties. According to ANCE, in H1 of 2017 about 70% of the construction companies recorded late payments from public entities (paying after 156 days on average, compared to 60 days required by EU laws). At least it can be said that average payment delays have shown an improving trend in recent years, down from 160 days in 2013 and 112 days in 2016 to 96 days in H1 of 2017. While the profitability of many Italian construction businesses remains low, at least no deterioration is expected in 2018. Non-payment notifications remain at a high level in 2018, but no major increase is expected. The same accounts for construction insolvencies, which remain at an elevated level. 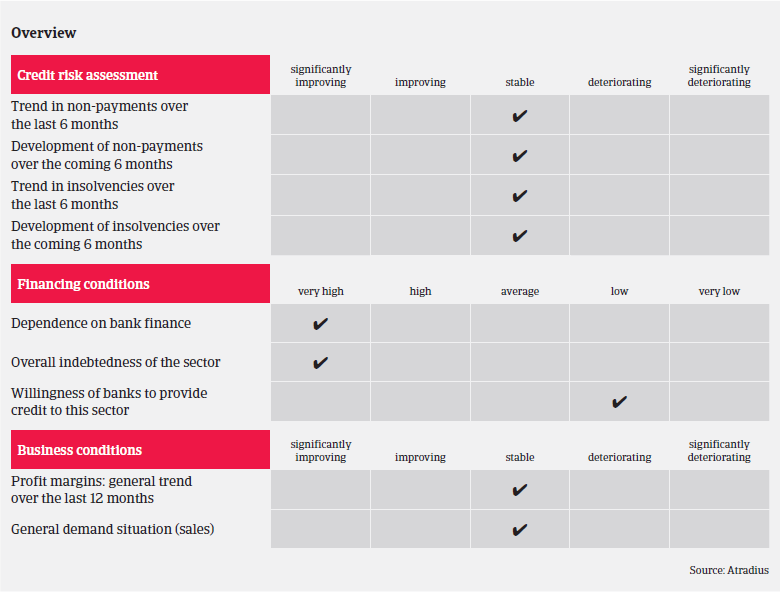 Given the on-going issues our underwriting stance remains restrictive, especially for small and medium-sized construction businesses as well as cooperatives and consortiums focused on residential construction and/or dependent on public construction (new buildings shrank by more than 63% between 2008 and 2016). The only exceptions are businesses active in renovation work supported by government incentives (up 20% between 2008 and 2016). While larger, more export oriented construction players have proved to be more resilient so far, we have recently taken a more prudent underwriting approach on businesses with substantial business in countries with elevated economic and political risk (such as Algeria and Venezuela). Both the rebound of steel and metals prices and increased domestic demand have helped to improve margins in 2017, which nevertheless remain tight.